Porsche is owning their final year in the World Endurance Championship’s top LMP1 class. The No. 2 Porsche 919 grabbed its fourth win in a row at the 6 Hours of Circuit of the Americas in a Porsche 1-2 finish. However, that win wasn’t easy after hours of pure chaos and a rad fight with the Toyota TS050 team. The last hour of the race started with a bang from—you guessed it—the top LMP1 class that’s been at each others’ throats all race long. The then-leading No. 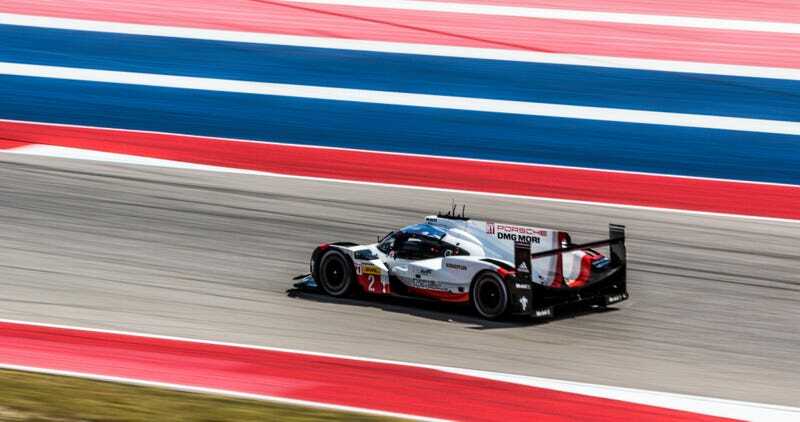 1 Porsche 919 was leading today’s 6 Hours of Circuit of the Americas, but the fourth place No. 7 Toyota TS050 tapped their left rear corner coming out of Turn 15. No. 7 was trying to go inside a Porsche 911 RSR (you know, the Porsche that actually looks like a 911) at the corner to try and make up some ground. The No. 7 Toyota met the faster No. 1 Porsche 919's rear left corner at the corner exit, nudging the No. 1 sideways, prompting a pit stop to double-check that the No. 1's rear end wasn’t significantly damaged. The No. 1 and No. 2 Porsche 919s became the clear favorites to win in the final hour, swapping the lead several times throughout the hour. On top of that, Toyota’s No. 7 car was handed a 10 second penalty in the last hour for its earlier contact with the No. 24 CEFC Manor TRS Racing LMP2. Ultimately, the No. 1 let the championship-leading No. 2 Porsche sail past easily on the main straight, despite Porsche’s earlier insistence that they do not do team orders. Elsewhere, the LMGTE Pro-winning No. 51 AF Corse Ferrari 488 GTE had a left front tire puncture with just over 11 minutes to go. However, driver Alessandro Pier Guidi had built up a nice lead over the second-place No. 92 Porsche 911 RSR and was able to limp the Ferrari into the pits quickly. It looked like the No. 92 would pass the leading Ferrari in the pits, but the No. 51 crew made the quick tire swap of the century to send Pier Guidi back out fast and keep the lead—just barely, but it counts! Behind the No. 51 was the real drama in LMGTE Pro, though, with an epic door-banging battle between the No. 92 Porsche and the No. 71 AF Corse Ferrari 488 GTE with around 19 minutes to go. The No. 92 ultimately emerged as the second-place finisher, but the rough back-and-forth was about as fun to watch as the earlier LMP1 battle. The No. 98 Aston Martin Racing Vantage dueled with the No. 77 Dempsey Proton Racing Porsche 911 RSR at the start of the final hour until the No. 77 slowed at Turn 13 with less than 30 minutes to go. The No. 77 went into its garage with what appeared to be an oil leak, losing most of the last half hour for a quick fix. The No. 98 won the class and surprisingly, the No. 77 didn’t retire. It went out for the final laps with just enough time to be classified as a finisher. LMP2 was the source of perhaps the least amount of drama, as the No. 36 Signatech Alpine Matmut had an entire lap separating it from the second place finisher. There was a minor scare in the last half-hour where the No. 36 was ordered by the stewards to repair its rear taillight, but it was so far ahead of the next LMP2 that its repair stop with just barely over 10 minutes left didn’t even matter. This is the Alpine’s second straight win in a row as well. With no other WEC race scheduled at COTA for a while, this seemed like a fitting end: a race so exciting that choosing when to take a pee break was truly, genuinely hard. Hopefully WEC comes back here after their strange transitional season is done.